Progress Saturday 31st January 2014. Another perishing day. The LMSCA occupied themselves with doors and this theme also continued with our Foremen, once some snow clearance had been undertaken. Miserable conditions at base today but brave folks carried on with the refurbishment of pointwork and further attempts to resolve Iris cylinder head problems together with some remedial work on the "Bubble Car". An inspector of boilers came to look at The Duke and the Booking Hall continued with activities that will pay off in the season. It was quite difficult to be too positive today as you will see the second photo shows the white out that descended at lunchtime. PS - it was suggested by the PWT that you may have too many photos of the pointwork but I would respond that they undervalue their great contribution. 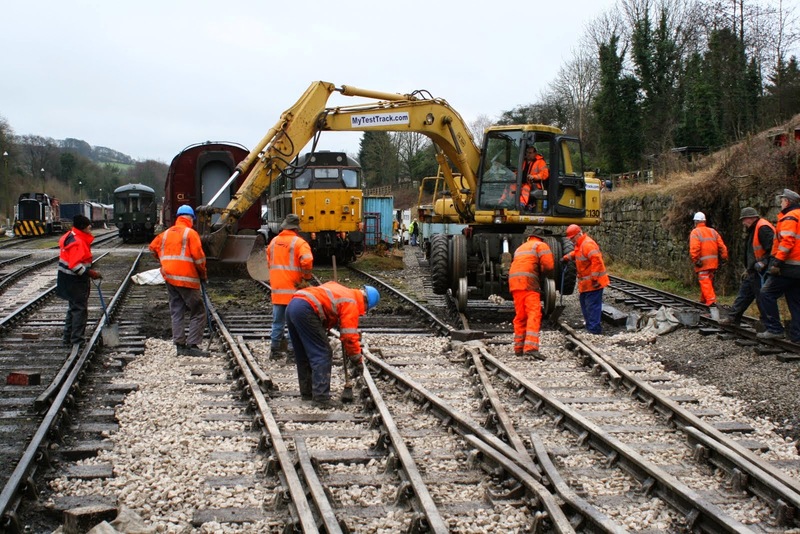 It is doubtful that the work they are doing has been undertaken for decades and when our test locos from London Underground arrive we can be comforted that they will not fall off for lack of track maintenance. 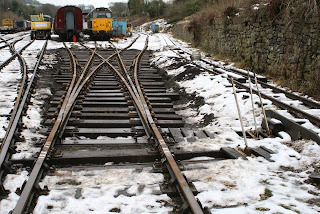 Snowing again today in Wirksworth but the PWay battled with it to continue with the point so known as P10. The LMSCA continued with the BSK welding up a door which had some tin worm trouble. We welcomed some preliminary discussions to do with some overhead catenary which will be used for testing in the yard. Not live of course!! We also welcomed the new training company, ARC, to Wirksworth who continued interviewing recruits for their course. Some work was done on the PWay bubble this afternoon but it was quite damp. Some spoil was moved at Duffield to tidy up. The Booking Office was in go mode and booked the band for Tunes and Chips. So far in advance we work! Book online at www.e-v-r.com/tunes15 - you know you want to! Another week another point. The PWT have stripped out P10 the point at Cemetery Lane Bridge for retimbering as we prepare for London Underground's battery locomotives. 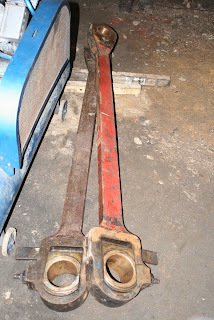 In the Maintenance Facility there are two views, one of Cathryn's connecting rods before refurbishment and, the other, of the first rod after Bob's ministrations. A quiet day with the Booking Office continuing with planning for this year. The LMSCA decided that a mid-project tidy up was in order inside the BSK. Some sorting out was done in the EVRA shop and more tidying done at Duffield as well. As the light was fading, two bogies were collected for pastures new. A reasonably pleasant winter's day saw us pottering around the puddles from snow melting around the site, but otherwise it was a dry day. Down the yard the LMSCA carried on with door works for their BSK and the DMU team proceeded with seat frames courtesy of Paginton Paintworks as well as carrying out an A Exam. Nearby, in the Training Room, we gained a further three volunteers for our enterprise at the monthly induction, carried out by yours truly and Station Perkins. In the Pullman, Oliver Stokes-Field dealt with some electrical work notably the cleaning of the lighting contactors, so that our lights shine brighter in the Peak District darkness, and people can see us frolicking in First Class from miles around. However, in terms of interesting steps forward, the Passenger Department began work on what will be our new Station Office accommodation. This is part of the former Tannery Building, adjacent to the back of the Mess Room and it is intended to replace two of our quietly rotting Portacabins. We are leasing the upper part of this building (a kind of balcony or mezzanine, level with our platforms) to give us a comparable space to the two Portacabins, about 50 square metres. The lower floor has another tenant. This mezzanine area will effectively become our reception, stores and office, given time and effort. As an indication of that effort, I attach three pictures. 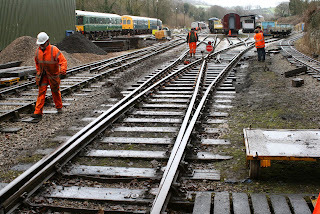 One showing a general view; one showing myself and JCB Purves repairing the safety rails and one showing Station Perkins and JCB Purves (again) wielding the paintbrushes, although today's work was mainly a tidying up and dust moving exercise. Progress Saturday 24th January 2014. 55006 received a good Exterior wash by the Students also. team repaired the Pullman Buffet Electrics so all worked well today !! for the Students who were appreciative of our help and time. The usual run of winter weather continues here in the arctic circle with snow on the ground and nearly freezing drizzle. 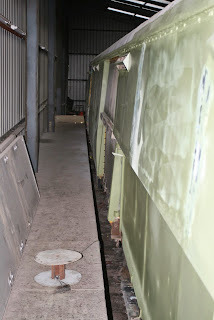 The LMSCA painted a door in the balmy warmth of the Mess Room and received a massive load of giant wood from the forests of Scunthorpe, or possibly Swadlincote, for their carriage floors. Field Industries occupied the morning machining a part and later rediscovered a pair of missing pants (thanks to Sharon). The Foremen continued their quest to remove more Christmas ephemera from our estate and had a preliminary foray into the nearby Tannery. The SO received attention and a World of Testing took place in the yard. Another splendid test day with two large machines, four trailers and a lot of weight! Very ably hosted by Tony Watt. 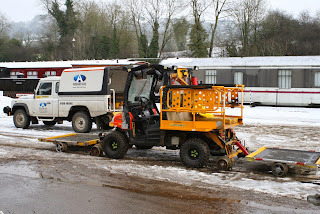 A remarkably busy day given the slush and muck still on the ground after yesterday's snow. We welcomed two customers to our Railway the first of which was a "traditional" test to satisfy the Vehicle Acceptance Body and is illustrated and the second was our new training company which will start trading on 1st February. They were holding interviews in the Pullman Buffet Car for the first 12 candidates to be assessed for track maintenance duties. The PWT managed to work their train to Shottle and the south to discharge disintegrating timbers and berth surplus freight stock. The LMSCA tended to doors on their Mark 1 BSK and the dmu team continued to wrestle with the cylinder head on Iris but achieved an "A" exam on 51505. At Duffield the clean up of the car park area progressed with the last bag of loco ash taken there and spread to good effect. The Booking Hall concentrated on future opportunities to ensure 2015 is a bumper year. Make snow joke about it, today was bitter! Not many on site either for obvious reasons although fortunately, the roads have stayed good. The LMSCA continued working on a BSK door producing new wooden facia for it. The PWay team came in this morning and, as you may have seen from Martin's video, did a little bit of shunting first thing before retiring for a bath. Two things for you. Firstly, bookings are now being taken for the Murder Mystery on Wednesday 24th June. I know it seems like ages away, after the longest day of the year, but we expect (and hope) it will be very busy. Details are on the website and you can book online at www.e-v-r.com/murdermystery . Secondly, I attach a PDF of a poster for the Circus which is coming to Wirksworth Station over the Easter weekend. Feel free to print it and put it up somewhere. It is in A2 size so if you want to do it smaller, just tell the computer to "fit to printable area". Our PWT heroes shunting in the snow today to clear the way for tomorrow's planned testing. Many thanks to Tony, Vince and Hylton for braving the elements. Progress Tuesday 20th Jan 2015. Despite the gloomy weather forcast, today turned out to be one of the best days for a while with sweltering temps of at least 5 c and the sun beating down. 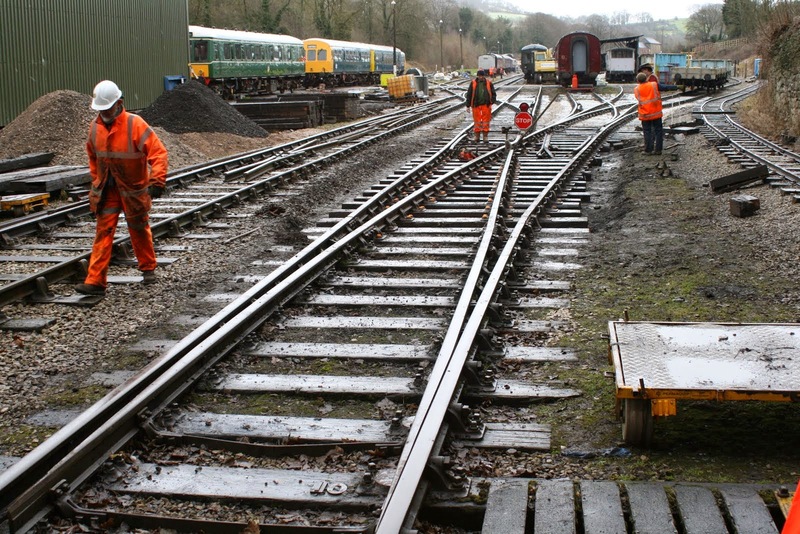 P way continued work on the 3 way turnout stretcher bars which is like a Chinese puzzle, tidying the work site, preparing the works train for Wed and making preparations for stripping the next turnout for attention next week. The planned track packing had to be postponed due to the ballast being frozen solid. 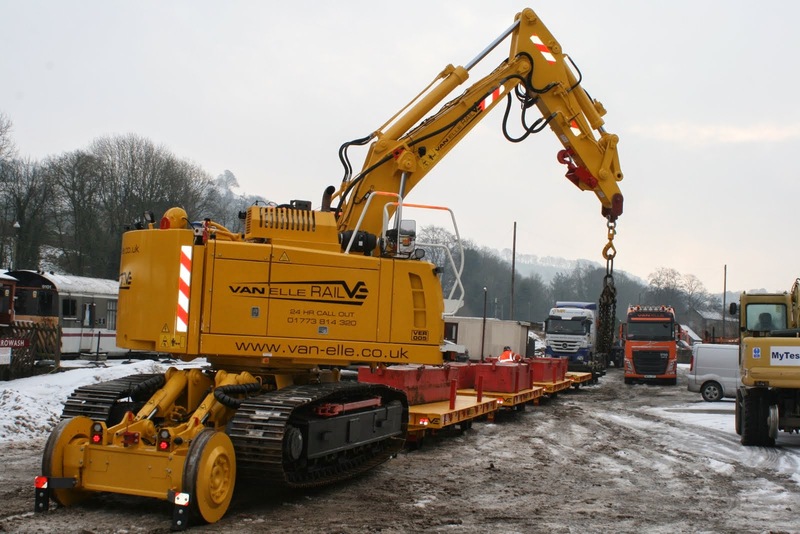 VCT had a good day with 7 members attending 2 fires at mp 134 and Mike the flail cutting down the vegetation on the incline with the Komatsu. LMSCA were in attendance again working on the BSK. The buffet was open for business and looking at the orange jackets in there at lunch time and the lack of bodies and chip papers in the mess room they got some. Steam team were preparing for wash outs and continued with the never ending welding up of axle boxes. DMU team spent much time shunting with the last remains of the steam crane runner sent to the car park for execution and despatch to the Razor blade and Cutlery Corporation in Shanghai. Passenger services met to discuss the last Santa event and what went well and what didn't with proposals for next year explored. Needless to say this year was a great success with a brilliant effort from all involved resulting in our best turnover ever. Bitterly cold in the Gem of the Peak today so it's not surprising volunteer numbers were low today. To be fair, the LMSCA continued their work on the BSK with attention turning to another door which needs to be in tiptop operational condition. 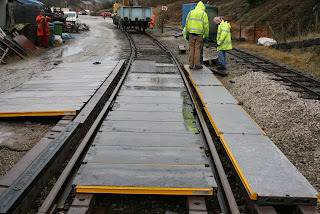 A member of the EVRA coach team also popped in for a bit and a lone PWay member began the task of marking out their next point relay project likely to begin next week. Never a rest in their world either! The Booking Office continued with the necessary routine admin. Random factoid... last year we surpassed 10,000 miles of passenger trains! A sunny if chilly winter day here in the Peak. Down the yard the LMSCA worked on the west side guard's door of the BSK and set up a new router table in their workshop. Unit 50253 had its seat legs ground by Paginton Grinders and Field Enterprises, working on some uprights, followed his grinder with a welder. The Pullman set received a great deal of attention with paint being applied in the GLV guards vestibule and with a new seat layout being adopted in the buffet to enable the Ice Cream freezer to fit more comfortably. Interviews took place for the post of Catering Assistant and more of these will follow shortly. Work on problem solving the electrical system in the First Class identified a long standing fault preventing the lights and heating coming on, but this set still requires a replacement MA set to be sourced at a modest cost or for the duff one to be repaired at an equally modest cost. Nothing containing four noughts is likely to be considered given how heroically tight our R&R budget is. A rather chilly winter's day with occasional snow flurries. Down the yard the LMSCA received a large wad of clamps and worked on the doors of the BSK. Around the station the Foremen carried out repairs on the crossing guards and converted a buffet cupboard into, well, a buffet cupboard. 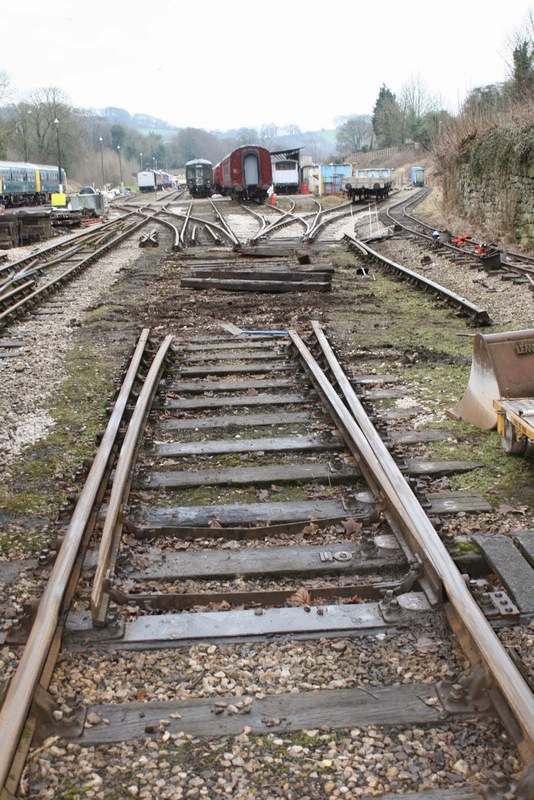 The full panoply of routine station inspections found that nothing had fallen off and Duffield reported that ash was being laid on the paths. I have illustrated the recently renovated three way point on many occasions but this final photo sees it fully restored as it represents one of our most complex projects and is a quite unusual piece of pointwork that is of great vintage. Our Permanent Way Team deserve great credit for bringing this piece of our history back into use. 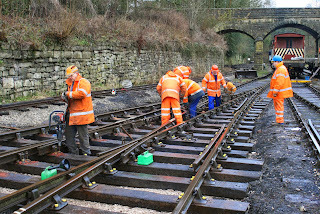 The team today ended their day by discharging the Sturgeon of the rail to be used in bringing the track through Platform 1 back up to standard. The present rails will then be used to provide the third track in our enlarged Maintenance Facility which, as ever, will depend on share holder funding. The LMSCA continued with their surgery on the Mark 1 BSK and the dmu team had some frustrations with fitting a cylinder head to Iris. The Booking Hall concluded the sale of our surplus nameplates from Tommy and Hydra and achieved a further coach group booking together with a training day for Virgin Trains. 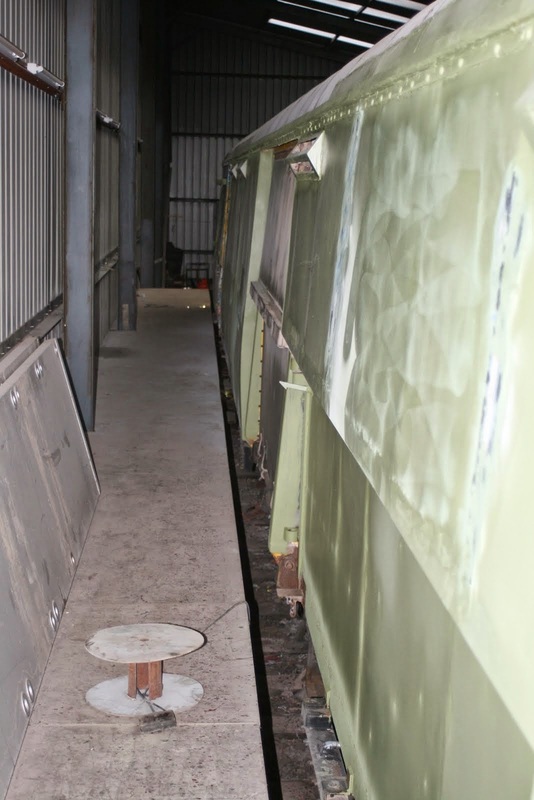 Work was undertaken to check that the dmu fleet was up to date with its planned maintenance regime. Duffield witnessed further tidying up of the site around our cabin there together with the application of paint to try and improve its look. The day was intensively cold and feature a brief flurry of snow. All on site are to be congratulated in working in the most unpleasant conditions. 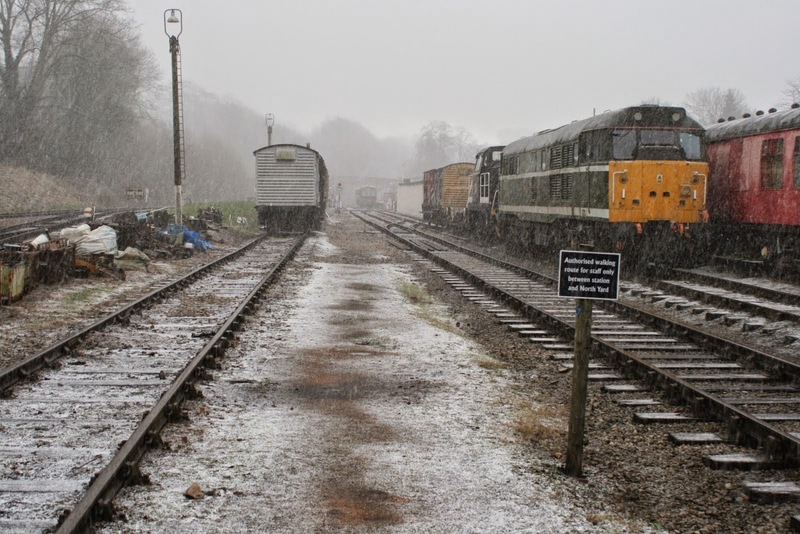 A strange kind of day in some respects with a special driver training departure from Wirksworth this morning. This doubled up as a most useful exercise in looking at and discussing aspects of the entire railway and items along it's length. Back at base, the LMSCA continued with the BSK rebuild. Derek was seen poking a screwdriver into a lock on a newly reskinned door at the time of passing. I suppose the heros of today were the PWay team who had secretly got three way point into such a state that they could run a train over it, whilst their leader was down the line. It does look amazing. With all the activity I forgot that the other illustration today is of a temporary road/rail access point being developed by an Ashbourne firm. This is their third visit and the project seems to be coming along well. Testing and trials seem to have been missing from the Kings Cross Christmas work but maybe we can help in the future? A quite amazing day with some 40 volunteers on various sites. The VCT assessed the trees at Duffield at the south end of our present car park and deemed them a little too difficult for their skills due to their proximity to the main line. A wise decision given the grief that a wrong move would cause! However, they went on to fettle the 1 km of sheep netting already erected and achieve a further two fires involving their 6 man team. The people with the most visible change in our scenery were the PWT who jacked and packed the product of retimbering the 3 way point with the delivery of the final top stone to achieve a great result as illustrated. Doesn't it look good? The VCT tended to matters down south with a abortive visit to Duffield where the challenge was deemed a too great, a decision I endorsed, but worth a look. Nonetheless the six man team went on to produce two brash fires and made further inroads to the sheep netting installations. 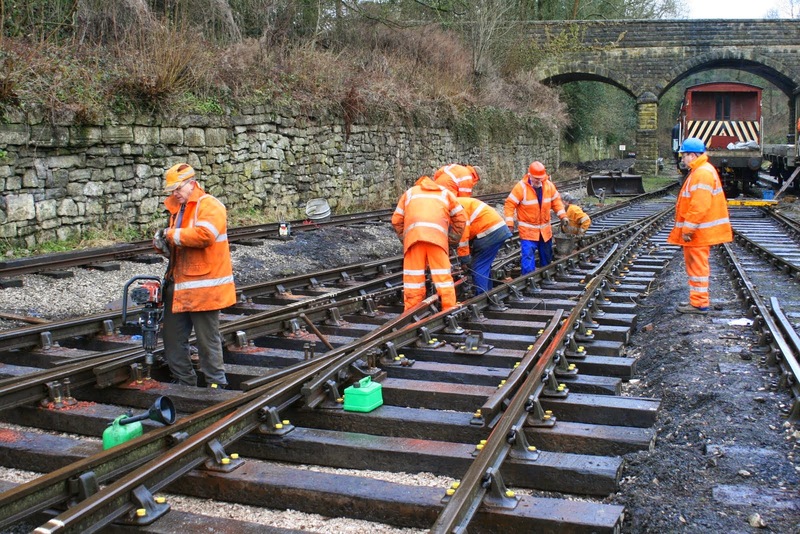 The dmu team face the challenge that many of their electrical supply leads seem to have been stolen overnight with evidence that the north end of the Maintenance Facility is being used as a recreational area by some Wirksworth residents. A reminder to all not to leave anything that can be lifted with ease out for the less worthy to access. 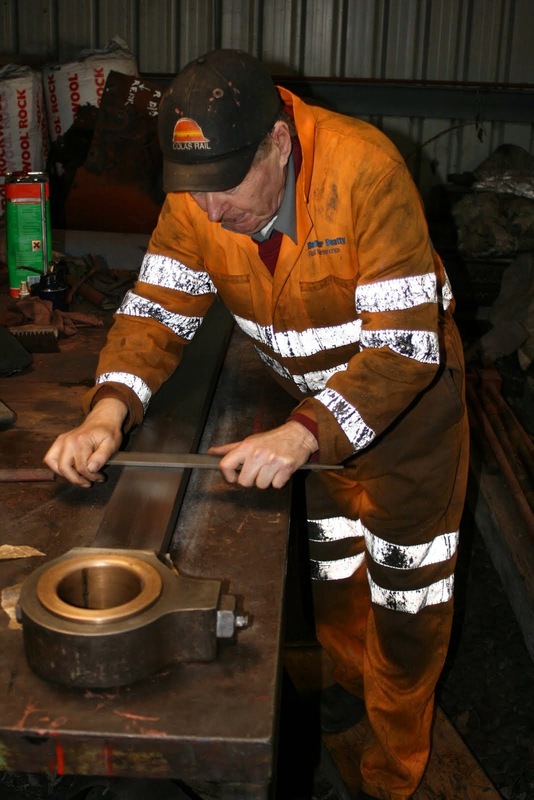 The DST continued a wide number of tasks which included the overhaul of coupling rods, welding of axle boxes, fitting of buffers to Henry Ellison and preparing the loco for a boiler washout and machining of axle boxes. The LMSCA tended to the doors on the Mark 1 BSK, sewed bellows and roof lined the BTO together with installing beading on the BSK. The M1M tended to the wiring underneath their SK together with some roof lining. Eric Boultbee was introduced to the mysteries of the road/rail Landrover and deemed competent to operate the vehicle in revenue earning service whilst Anne, his wife, opened the Pullman Buffet Car for its first Tuesday of the year. Modest success leads us to pursue Tuesday openings for the rest of 2015 so " use it or loose it"! The Booking Hall continued to deal with a range of earning opportunities and mytesttrack.com looks set fair for quite a spectacular year. Just three people on site at Wirksworth today which led to a good day to continue with admin. A booking came in for a wedding reception party who want to travel from their wedding ceremony in Duffield to their home at Cower's Lane for a garden party. Needless to say it's in the summer! The LMSCA carried on with their brilliant work on the back end rebuild of the BSK. The back end is, indeed, now rebuilt and work is turning towards the inside of the brake compartment. 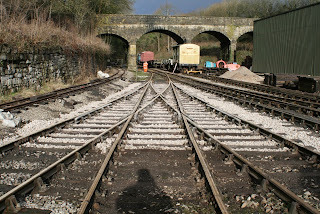 At Duffield, some more tidying was carried out. Apologies for the short refreshing wait for this report which is due to a WDS problem (Wobbly Dongle Syndrome). We had a delightful day of lamp head fitting, seat grinding and conscript scrubbing. The LMSCA attended to a new BSK door and some routing. The Passenger Department assisted by some security staff shocked the entire stores and some of the Pullman into a tidy condition and we removed part of the fallen tree to despatch it to the great potash pile in the sky. Staff at Duffield also appeared to be in a frenzy of tidying up. Progress Saturday 10th January 2014. Exterior.Lots of small but important tasks by all Groups. cloths,towels etc would be very welcome. A rather pleasant sunny morning gave way to a little wind and then to rather more wind. The LMSCA carried on repairing their wood for the BSK and consulted on the arrangements of the BSK's new kitchen with a local microwave technician. Around the station, the Foremen removed more of the evidence of Christmas and now only the very observant will note where the Reindeer have been. Following this they then removed a large fallen tree from the Children's Area path and concluded their day by painting a lamp head. A gentle day on the surface but much background work involving test customers and coach group bookings that will help set the scene for quite an exciting 2015. The dmu team restored to life our fork lift truck and continued to address the problem with one of Iris's cylinder heads. 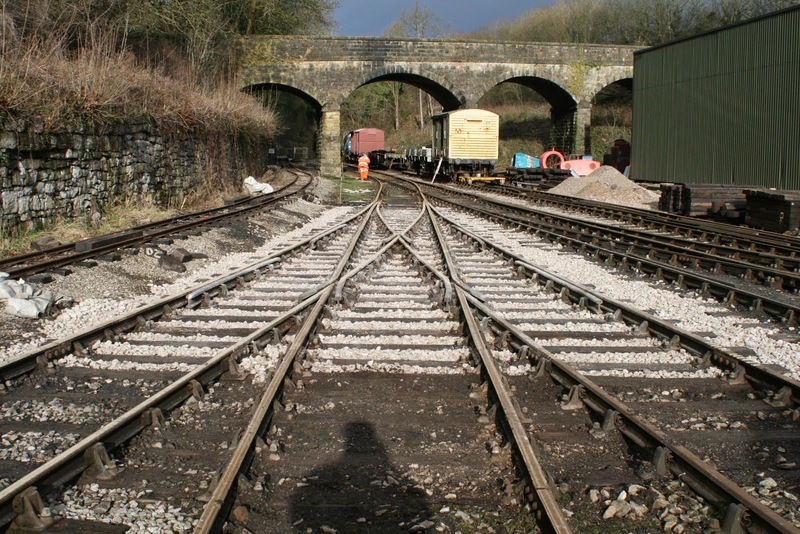 The PWT continued to prepare the three way point by trimming excess sleeper lengths and digging out bays to receive the first pass of white gold. A change in the weather again saw bright sunshine and some warmth after yesterday's most unpleasant conditions. A wet and miserable day which saw the Permanent Way team battle with the elements to continue the reconstruction of the three way point. The attached photograph shows the progress so far as this project continues apace. Also attached is a photograph of their bubble car as work gradually continues with the bodywork on that. Lots of admin work was done today as the calendar really does start filling up once again from just next week! The Booking Office turned it's attention to some of the events this season as the quieter time is better to sort some bits out. More news soon! We've decided to sell the nameplates which were displayed on the Rolls-Royce Vanguard locomotives that used to be here. Look out for these on eBay later on tonight when the listings start. We have the pair of "Tommy" open for bidding and one "Hydra". MKT had to dash today and asked me to let the world know of the endeavours today. Quite a few teams have been around today with a reasonably sized team continuing with the three way point. This project is coming along really well and the weather, touch wood, is being kind. The DST have been in today sorting out their axle boxes - I'm sure Bob can shed some light! 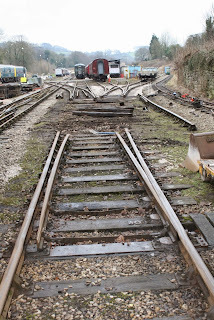 The DMU team were having a tidy up of components in the yard to clear some space for some more trackwork coming up, and work continued on the PWay Bubble. An enquiry came through about a possible further donation to this project which would be most welcome. The LMSCA continued working on the Third Open and the BSK. I must say the quality of the workmanship on the BSK is brilliant. Work continued in the buffet reorganisation with some general cleaning and tidying going on. It seems the buffet will be open with short hours on Tuesdays from next Tuesday if you're passing. The Booking Hall continued with general admin which seemed to take all day! Further south, the VCT were working towards Hazelwood. Not a bad day for a winter Monday. This morning the new training company were shown around the site at Wirksworth and made to feel welcome. The Booking Office caught up on some admin that had been building over the last few days and took bookings for a team building day from a TOC and also a coach party booking too. The EVRA coach team were out in force sampling the mince pies left in the mess room and the LMSCA continued with the BSK too. Lots of tidying up post-Santa took place and the train was given a thorough clean. At Duffield, the disposal of the Christmas tree began. An absolutely perishing day saw us warming our parts in the Mess Room and anywhere else that boasted above zero temperatures. Down the yard the EVRA carriages received attention, and the LMSCA finished work on their BSK gangway door and door locks. The DMU team struggled with various flat batteries and managed to fit in some coolant heater cover painting in the brief winter sunshine. Back at the station the Passenger Services Department (Brassington and Co-op Divisions) continued their efforts in the Pullman, with the replacement of a further duff heater and the replacement of yet another recalcitrant fridge. On platform 1 Stokes Enterprises spent the day pole prepping as part of the north end illumination project (a new lamp head). There was a slight feeling of "after the Lord Mayor's show" as we delivered the New Year offer of a train with fizz. A quiet start made us wonder whether anyone would turn out on a dank, dull day but we were pleasantly surprised and all went very well. My thanks to the train crew and Cooke and Son who dispensed New Year cheer to our passengers. Also due special thanks was Anne Boultbee who stepped in to staff the Pullman Buffet Car achieving satisfactory results after till, water and electricity supply problems. The Booking Halls at Duffield and Wirksworth also had a productive day. So take your hats off to those that delivered our first earning day of 2015. There was also a little activity by the LMSCA on their Mark 1 BSK and Alan Taylor quietly represented the M1M with a little painting and staining in their SO. May I wish all who read these daily ramblings a most Happy New Year and welcome to 2015 which promises to be a great, if not very demanding, 16th year of our enterprise. As ever, it is onwards and upwards. PS - today's photo follows many others in celebrating the PWT and their significant achievement with the complex three way point - the snow has nearly gone enabling further great things next week!